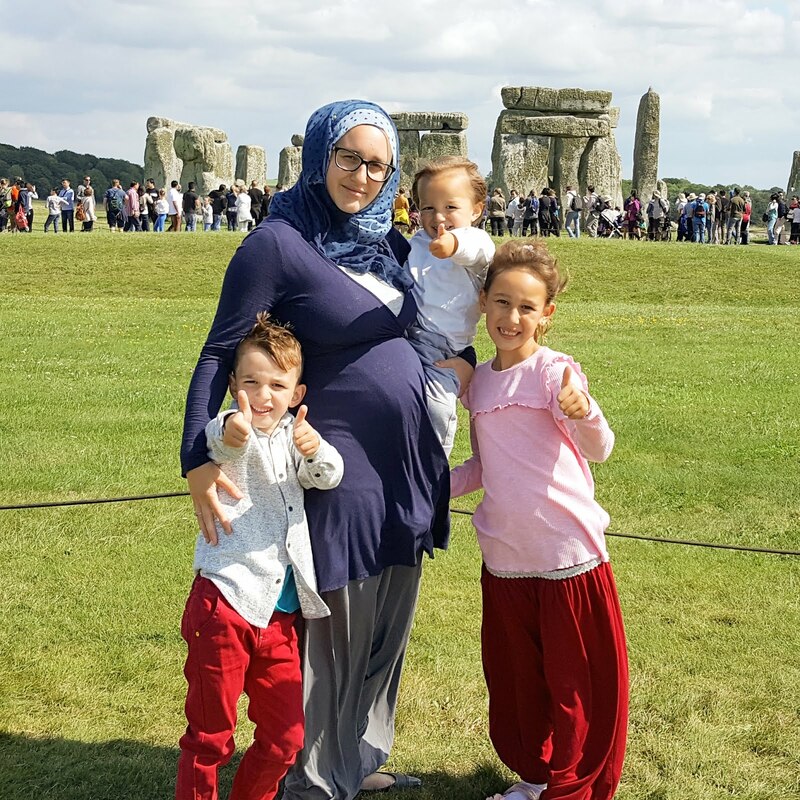 The month of October was pretty laid back for us due to the birth of baby Asiya at the beginning of the month. I had planned to not do any homeschooling at all, but I couldn't resist doing some of the nature curriculum this month because Autumn is my favourite time of year. We did bits and pieces on and off throughout the month and not necessarily in the right order, however, we managed to cover most things. 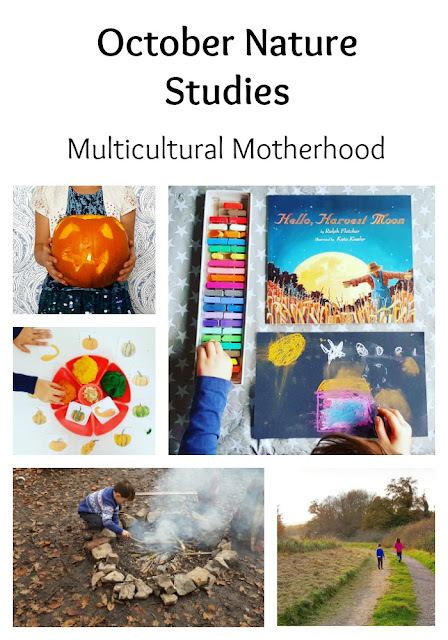 I must say, this curriculum makes homeschooling with a newborn super easy! I did not have to do too much thinking and planning as it is all there for you. 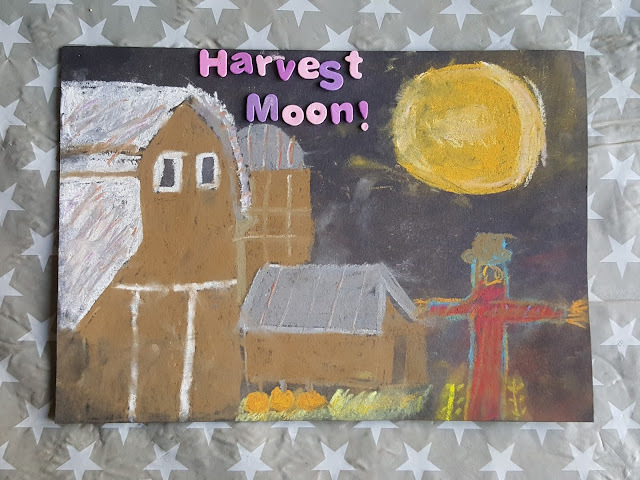 Before using this curriculum, I had never heard about the harvest moon so this was a new learning experience for me as well as the children. I love how that happens with home educating! 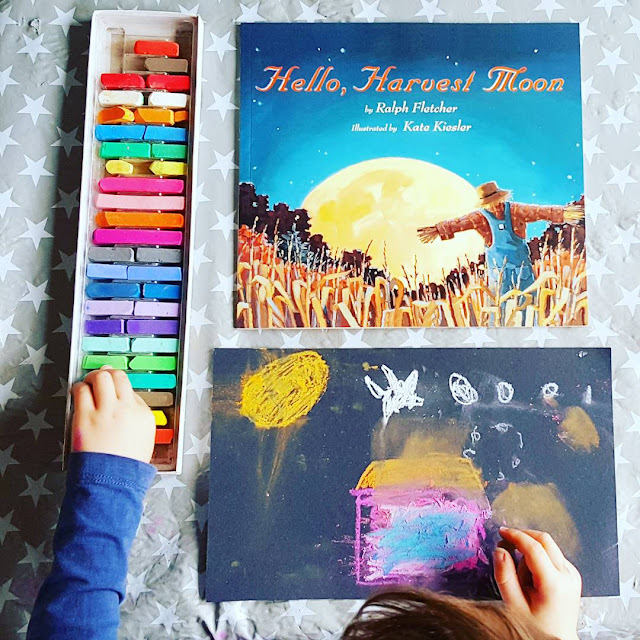 We started off by reading the book 'Hello, harvest moon' by Ralph Fletcher. Then the children used the book as inspiration for some chalk pastel drawings. 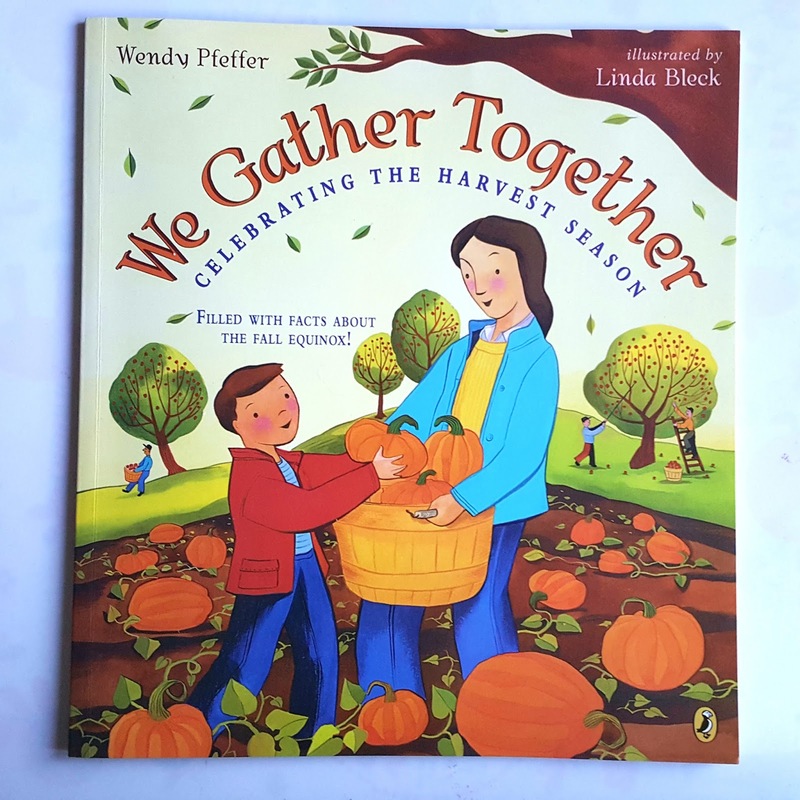 Next we took a look at the book 'We gather together' by Wendy Pfeffer. We really enjoyed this book. 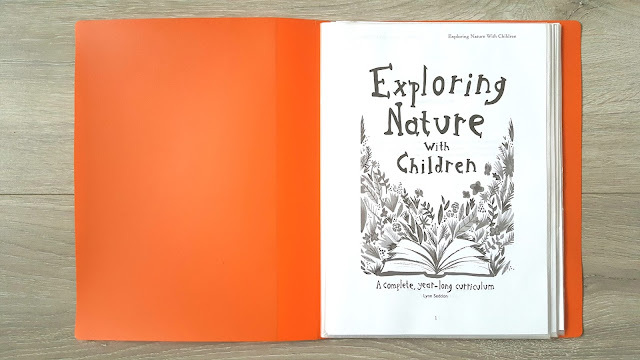 I was impressed with how it contained so much information in a simple, child-friendly way. From this book we learnt about harvests over time, starting at the Stone Ages. Then we learnt about different harvest festivals. This inspired us to learn more about these festivals. We took a look at YouTube videos to find out more. Unfortunately, we were unable to go on a nighttime nature walk to take a look at the harvest moon as this was impossible with a newborn. I will look forward to doing this next year. This topic is a particular favourite of mine. The beautiful colours of the leaves during autumn is one of the reasons I love this season so much. We started off by learing about why the leaves change colour. The chlorophyll (green pigment) diminishes due to lack of water. This allows the other pigments in the leaves, such as xanthophyll (yellow pigment) and carotene (orange pigment) to become visible. 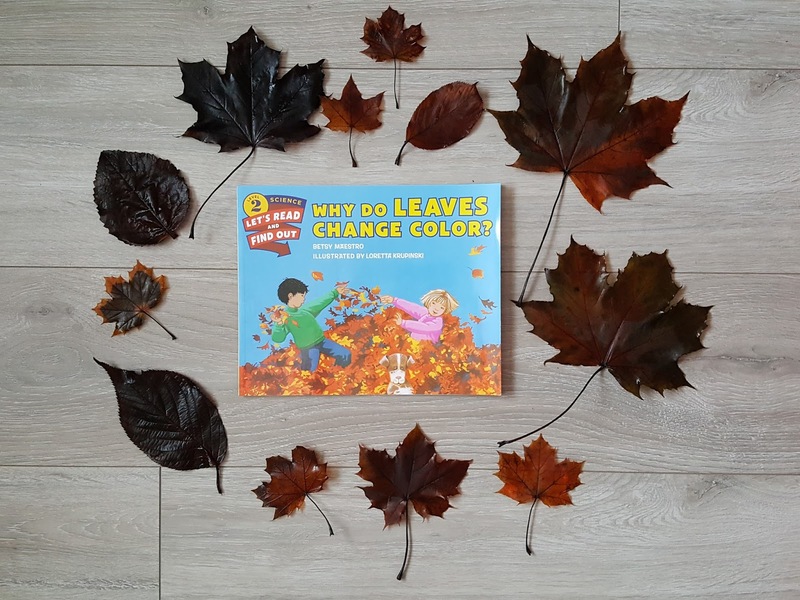 The book 'Why do leaves change colour?' by Betsy Maesto explained this concept well. We went on a nature walk around our local park to collect some different leaves. The colours of the leaves were stunning and it was great to get out in the fresh air after a week stuck indoors. 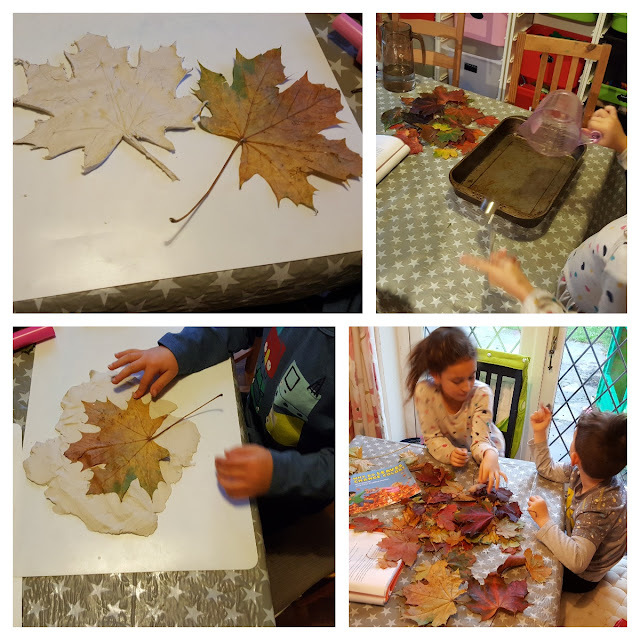 When we got home we sorted out the leaves, choosing which leaves we wanted to preserve. We placed our chosen leaves on a baking tray and poured over them a solution of glucose and water to preserve them. We left them like this for just over a week. 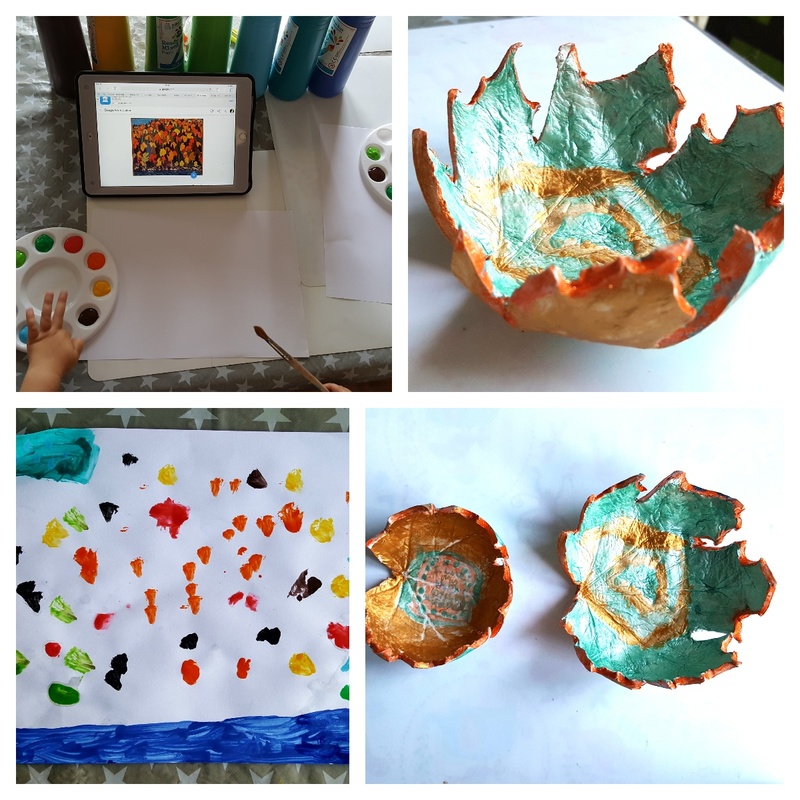 We also used a few large leaves to make leaf bowls. We got some clay and rolled it out. Then we placed a large leaf onto the clay and pressed it down so that the veins of the leaf would imprint into the clay. We cut around the leaf and then lifted the leaf off the clay. Then we placed the clay leaf into a bowl to dry. This allowed the leaf to remain in a bowl shape while it dried. Once they were dry, we painted them with poster paints. Finally, we took a look at the recommended picture study. R had a go at replicating it using poster paints. 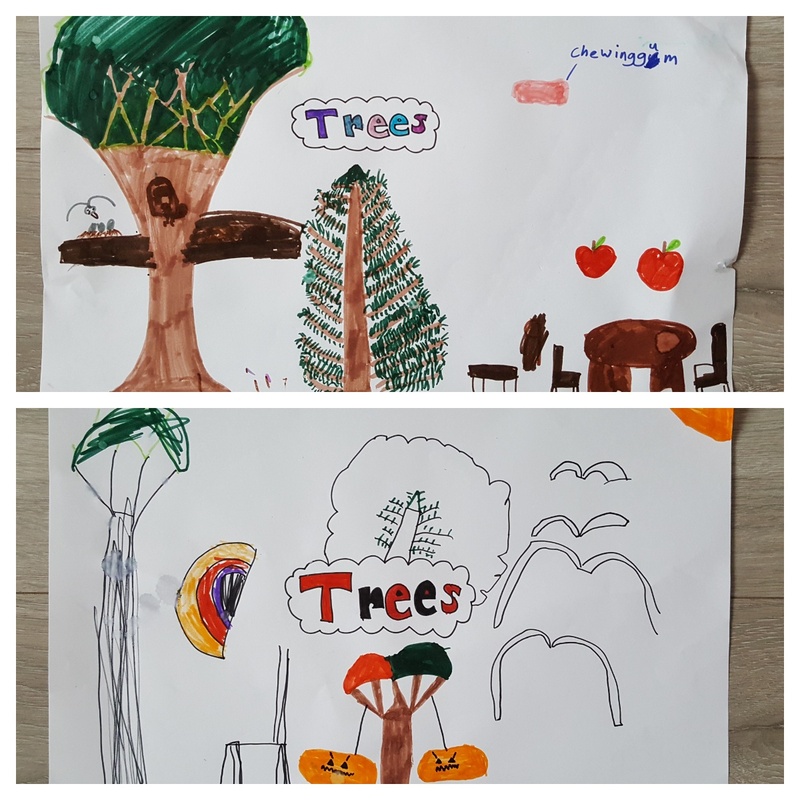 This week we went for a walk in the woods and took a look at all the different types of trees. We took a book about trees to see if we could identify any. 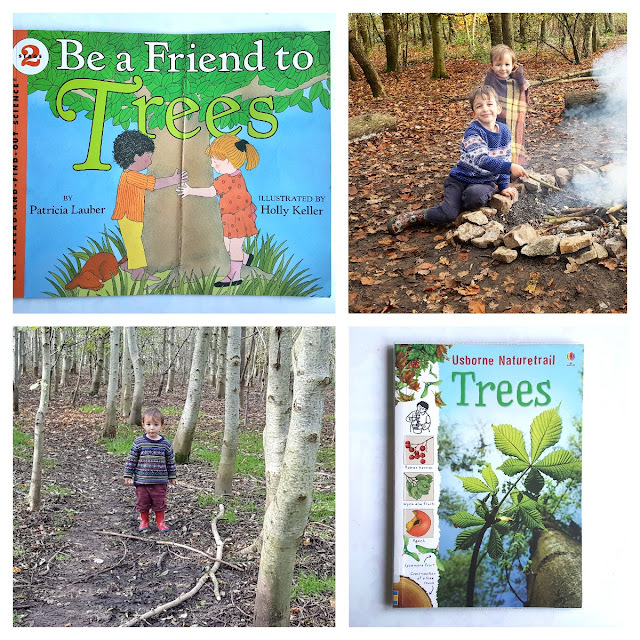 We really enjoyed reading the book 'Be a friend to trees' by Patricia Lauber. This book had a lot of information in it about what trees are for, from using the wood to make into tables, to using the sap for chewing gum. We also learnt about the importance of trees for giving us oxygen to breathe and how the roots help store water under the ground. The children made posters about all the things we use trees for. One thing they found particularly interesting was how cacao, which is made into chocolate, comes from trees! We had a lot of fun during pumpkin week. 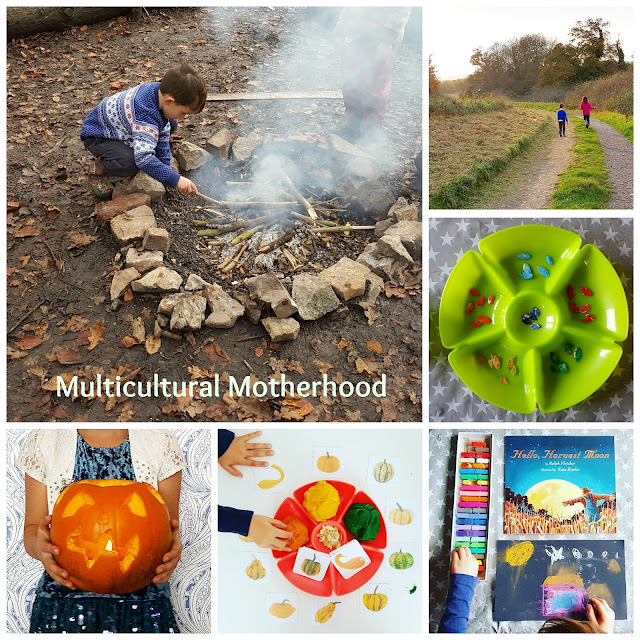 Who knew there were so many activities we could do about pumpkins?! We started off the week by going pumpkin picking for the first time. 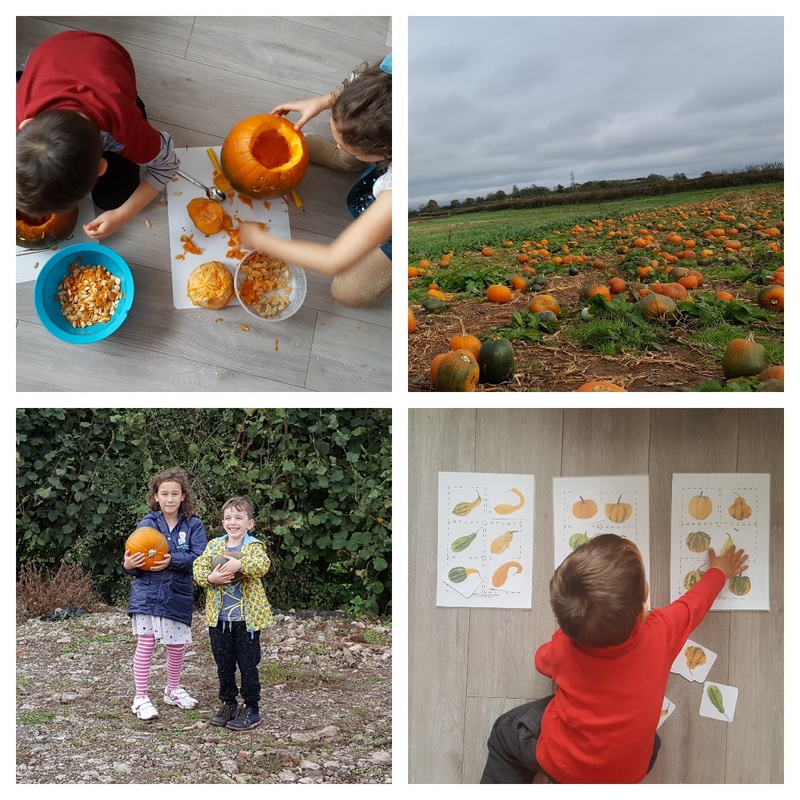 It was lovely to see a field full of pumpkins and the children enjoyed picking their own to take home. At home, the children scooped out the pumpkin seeds. We discovered this was easiest done using our hands rather than a spoon. Then, the children got creative carving faces into their pumpkins. After they were carved, we placed electric tealights inside as I thought these would be safer than candles. I tried to get some different types of pumpkins from my local supermarkets but I could not find any except the usual round, orange ones. 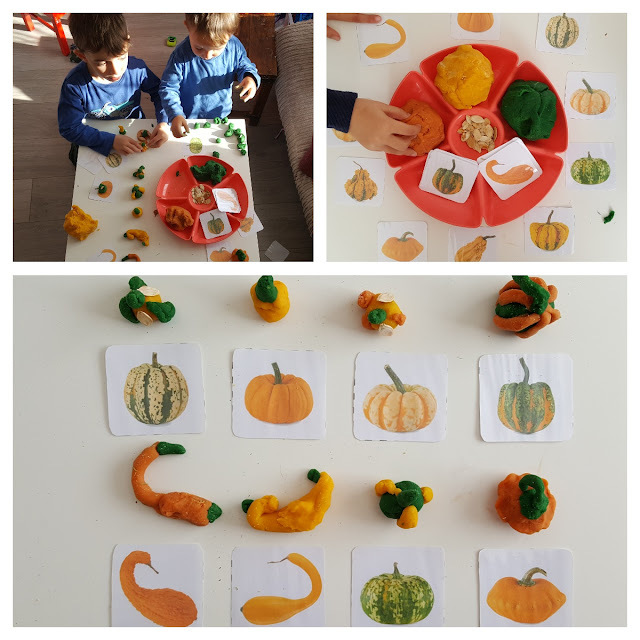 I found a some pumpkin flashcard printable online and printed two sets off as a matching game for K.
To explore the different varieties of pumpkins and squash in more depth, I set up this play dough activity for the children. We used our homemade play dough and used the flashcards as inspiration to make the different varieties of pumpkins. I was really impressed with the children's models. Finally, we used the seeds from the pumpkins we had carved to make necklaces. I left the seeds on a tray for a few days to dry. Then, the children dipped them in posters paints to colour them. Once the paint had dried, the children used a needle and thread and threaded the pumpkin seeds on to make necklaces. I also set up a sorting activity for K with the painted seeds. 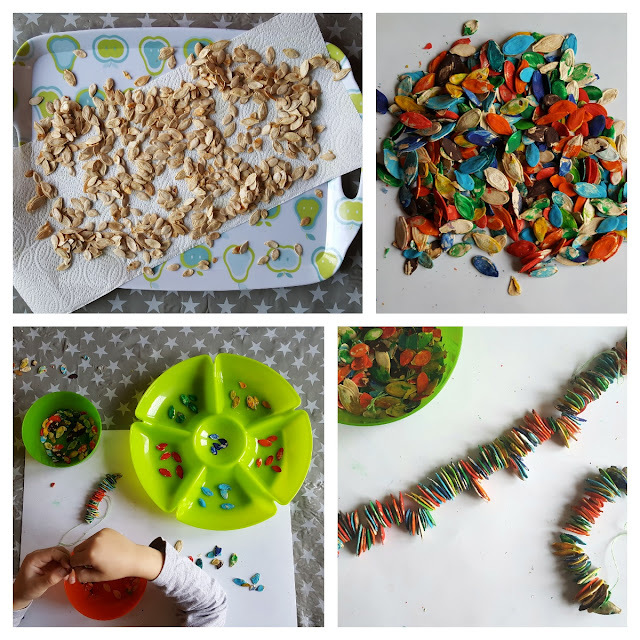 Toddlers love to sort things so I often set up sorting activities for K with different loose parts, such as different coloured counters, pattern blocks, glass pebbles, stones etc. 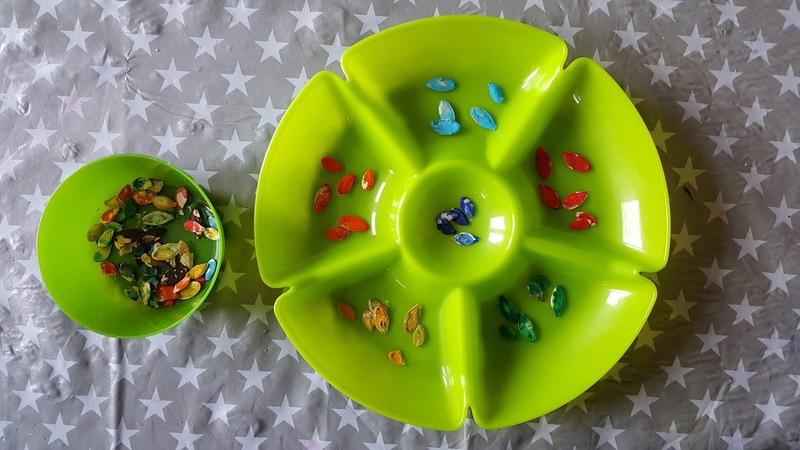 I like to use a sectioned serving dish for sorting activities as toddlers can sort the loose parts into the different sections. 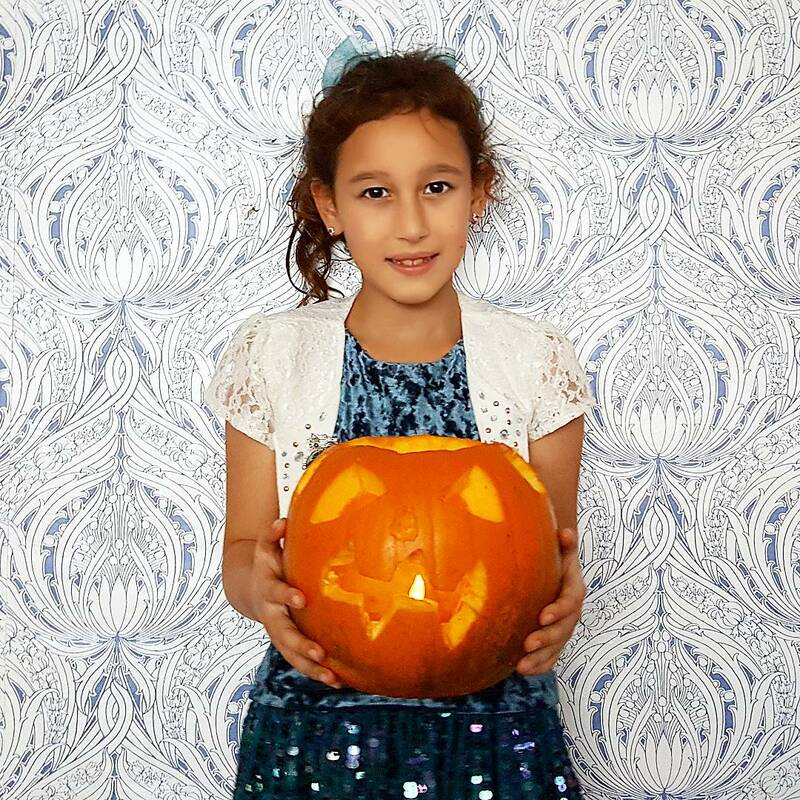 To read more about our pumpkin week take a look at this article. 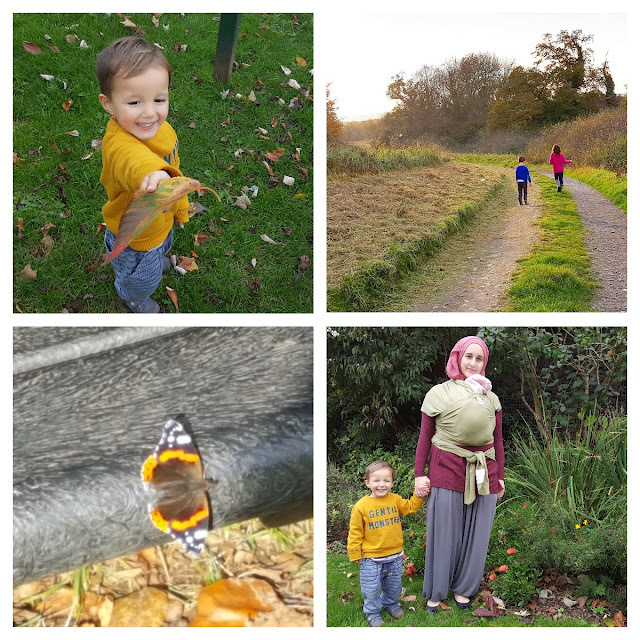 We have had a lot of fun with nature studies this month and have actually managed to get quite a lot done despite not having much time or energy. I am really looking forward to the topics we will be covering in November. To take a look at the curriculum you can use the links below. Have you been following this curriculum? What activities did you do during October?